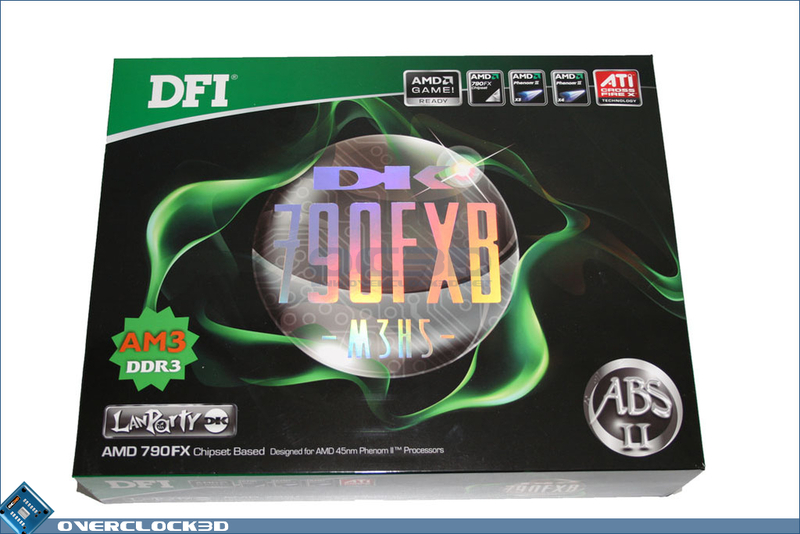 The exterior presentation of the DFI 790FXB DX M3H5 is akin to the new packaging design DFI are using across there range. Gone are the cartoon characters of the old Lanparty series. What we now have is an orb with the main product title surrounded by a smoke effect. 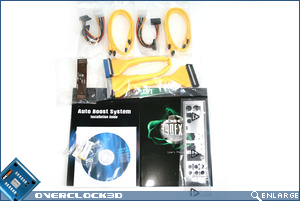 This motherboard also features DFI's second incarnation of the popular autoboost system. AM3 and the obligitory AMD and ATI icons round of the front of the box. Flipping the box over to the rear we see DFI have gone to great lengths to show off the main feature set of the 790FXB with detailed photographs and brief descriptions of each. 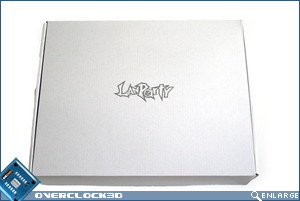 By removing the outer sleeve, we are greeted with a plain white box with a silver Lanparty logo emblazoned in the middle. 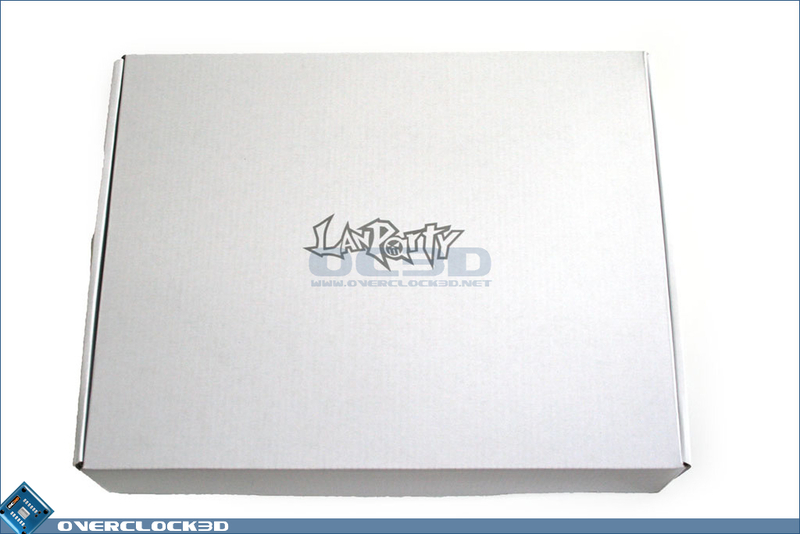 Once inside this box we find a compartmentalised unit separating the accessories from the mainboard. 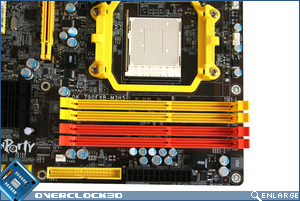 While this is effective in keeping the components separate it is a far cry from the design Asus use. That said, the package arrived in good condition and if it helps keep costs down then it's no bad thing. 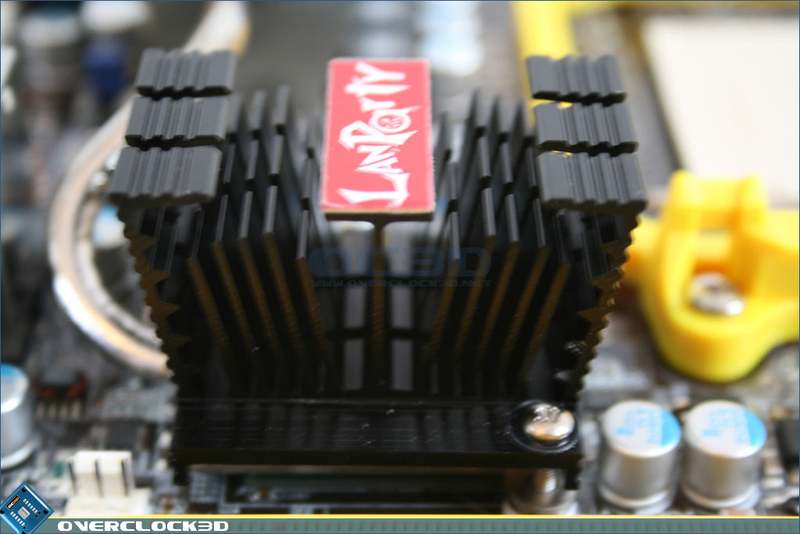 The accessory list is one which you would expect from a mid range board with UV reactive IDE and 4x SATA cables with optional SATA-Molex power adaptors. 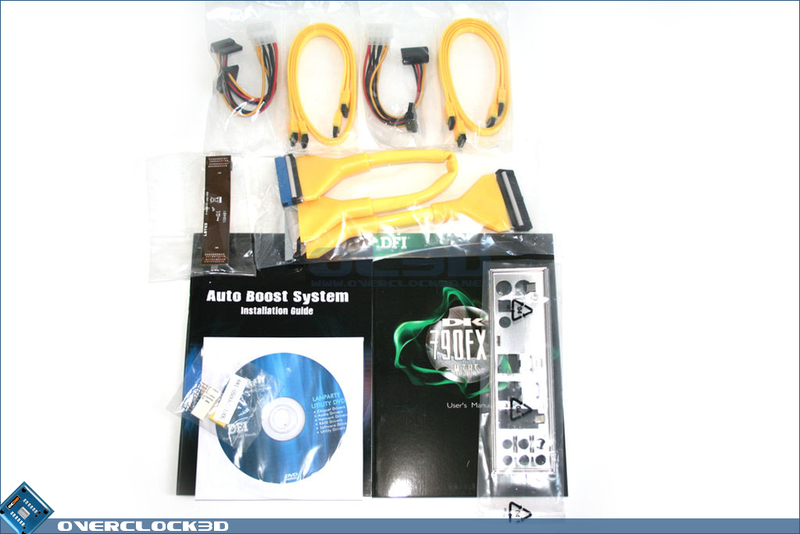 A standard, no frills I/O shield, driver/utility disc and a couple of manuals round off the accessories. A Crossfire bridge is also included for those who might have mislaid theirs. Ah, nothing like a blast of nostalgia to get the overclocking juices flowing. Those who remember the nForce 4 days will feel right at home with this colour scheme. 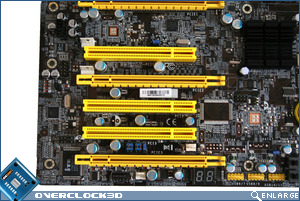 UV reactive yellow and orange plastic adorns a black PCB which now appears to be a trademark of DFI. 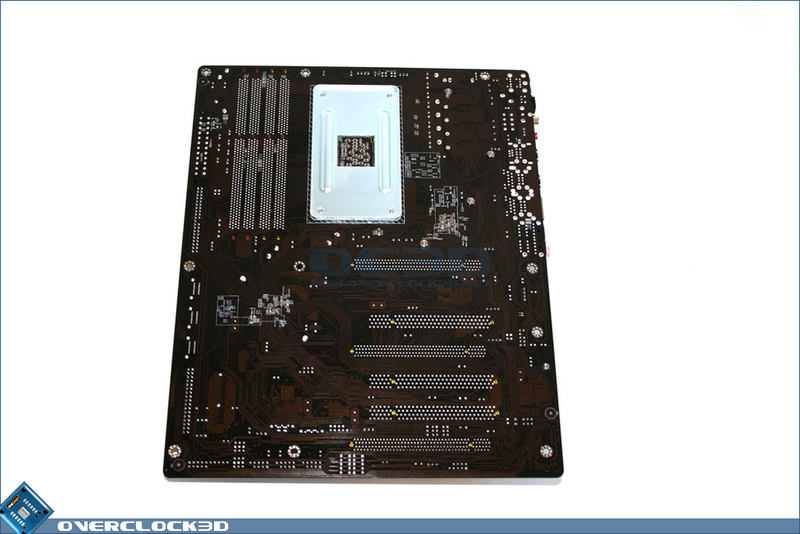 The overall spacing of the board, with all the right things in the right place but I do have concern over the proximity of the ram slots to the CPU socket. 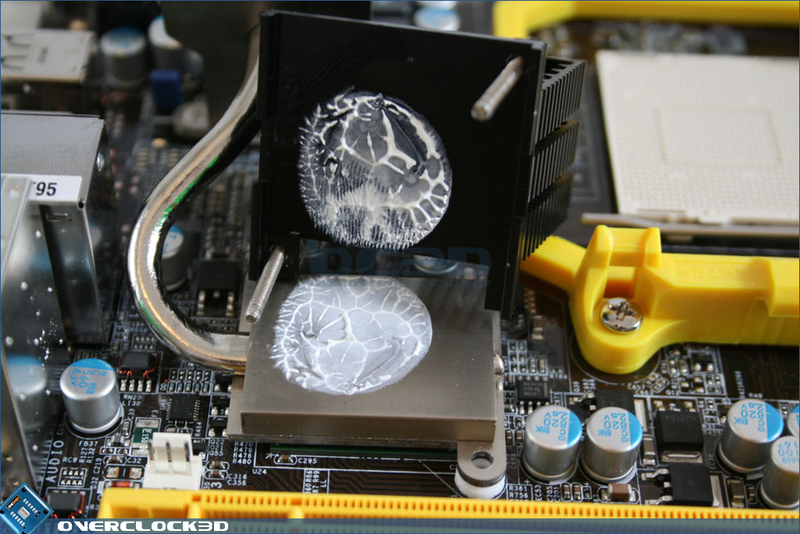 This will most certainly prevent oversized ram coolers being used with high end CPU heatsinks. 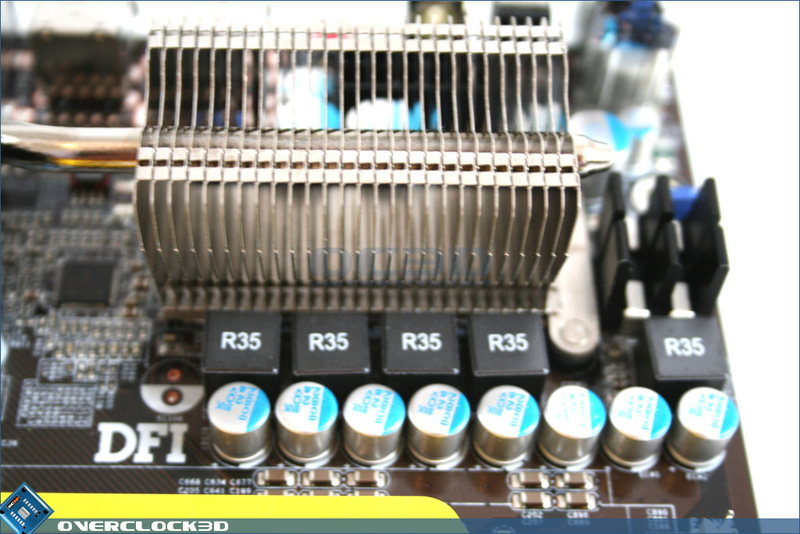 Note the additional PCIe slot of the DFI though which are all 16x and allow dual 16x in Crossfire configuration or 16x/16x/4x in CrossfireX. 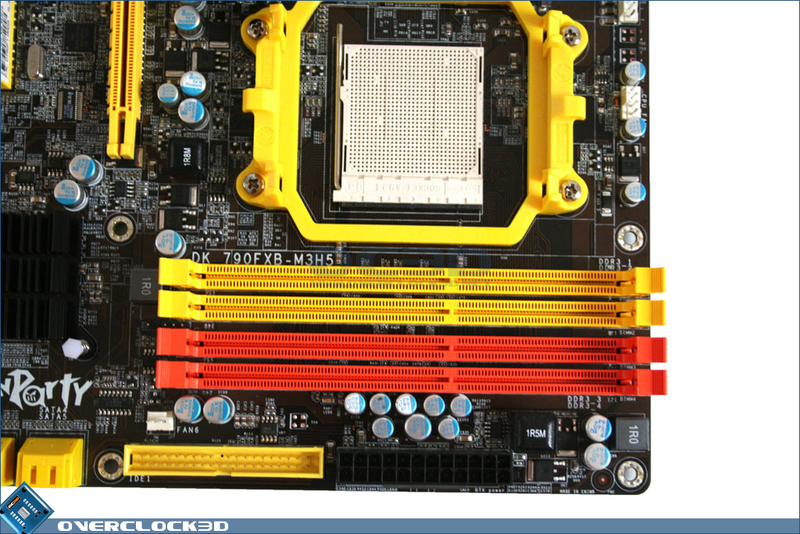 The CPU socket has the standard removable hold down plate (also in UV yellow) but the most interesting thing about the DFI's CPU socket area is the power delivery. The DFI 790FXB DK uses a 4+1 Phase digital PWM design (4 for the Vcore and 1 for the NB voltage). 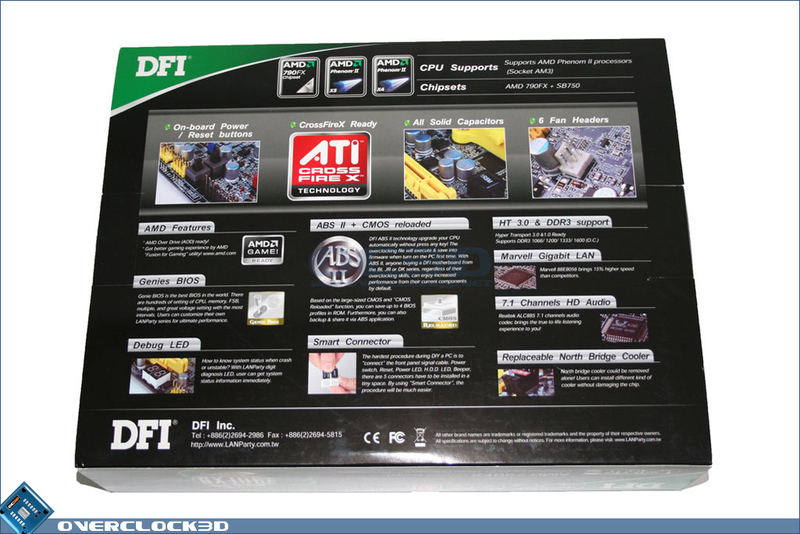 DFI claim that this design uses less power, gives greater stability as well as providing high durability. 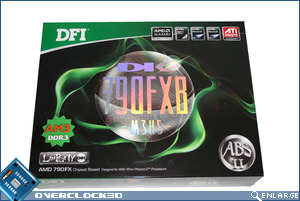 As with the Asus motherboard and indeed all AM3 motherboards, the DFI 790FXB DK features 2 dual channel DDR3 ram slots (2+2) which allow upto 16GB of ram to be utilised should you feel the need. 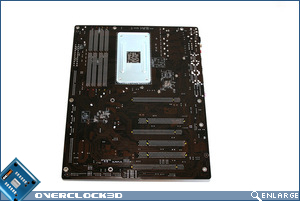 As already stated, this mainboard allows both Crossfire and Crossfire X. 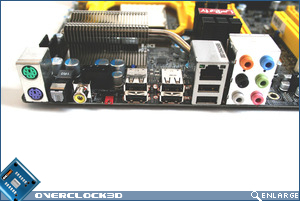 The two PCIe slots upper most on the board are controlled via the 790FX chipset and run at the full fat 16 lanes each. The bottom slot is controlled by the Southbridge (750) core which when running in CrossfireX configuration will be limited to 4 lanes. 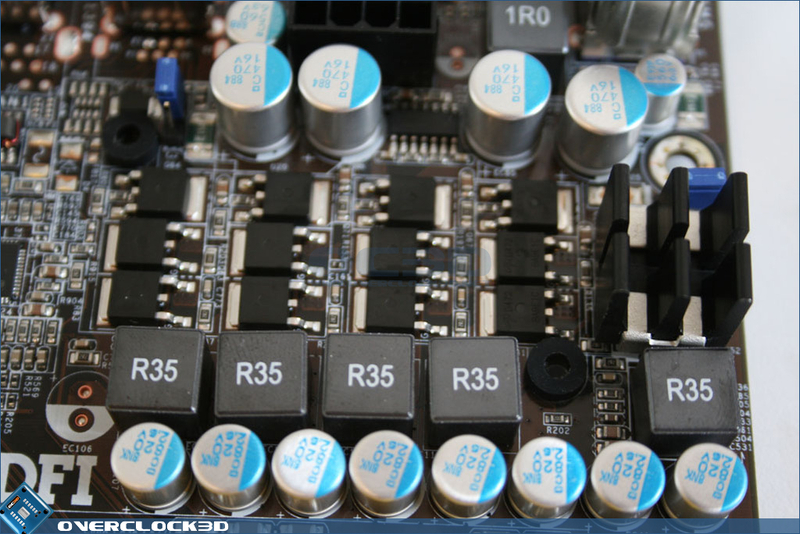 Interestingly, DFI recommend connecting up 5v floppy power cables to each slot when running multiple cards. Personally I have never seen any benefit by doing this but DFI claim it adds greater stability, especially when overclocking the GPU's. 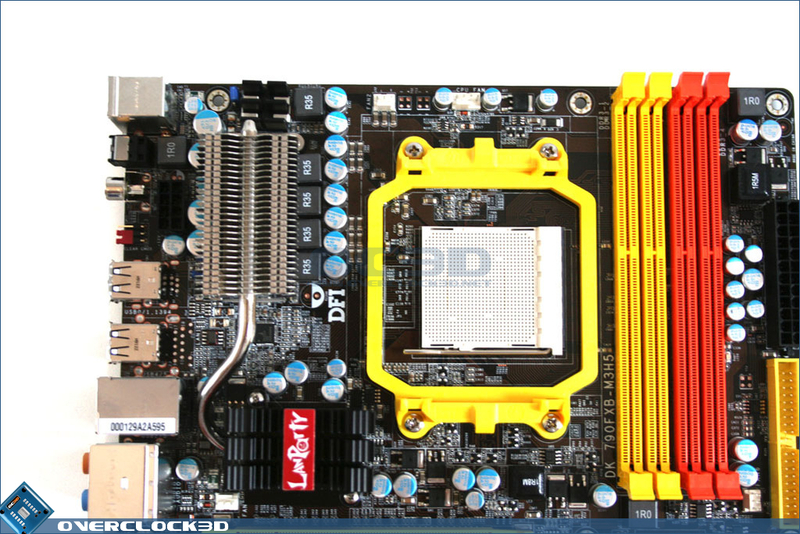 6 SATA ports are available on the DFI mainboard which is one more than the ASUS and DFI have also seen fit to include an IDE PATA port for those with ageing legacy devices. 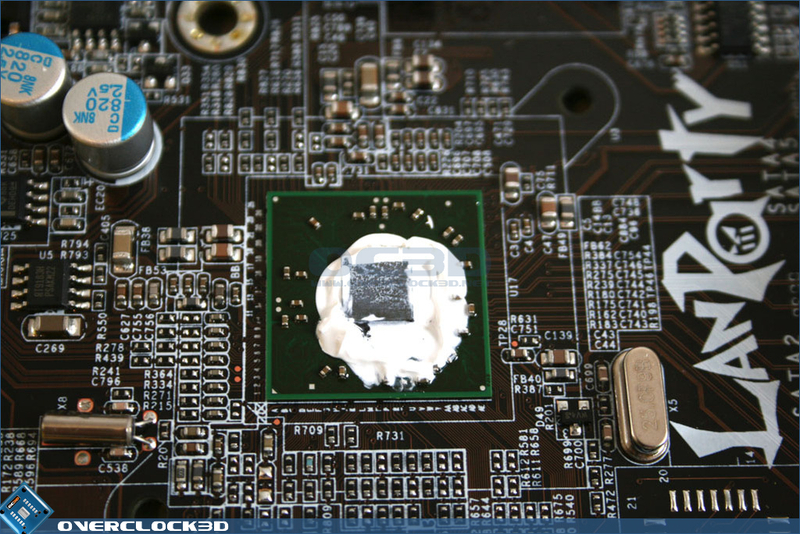 An area which deserves special mention is the inclusion of an LED debug device which allows the user to identify problem areas when overclocking or indeed when first installing your hardware. 3 USB headers are on board which are adjacent to the on board power and rest buttons, or EZ-switch as DFI like to call them. 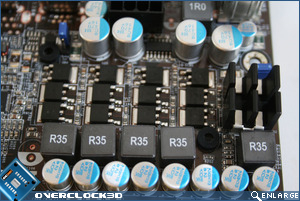 The EZ switch is actually a useful design in that pressing both switches together will return the board to a bootable state by resetting the CMOS. 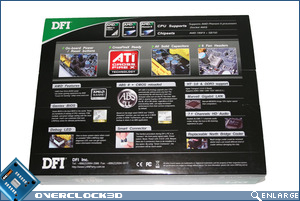 However should you need to do a hard rest of the BIOS, DFI have also included a jumper for this. 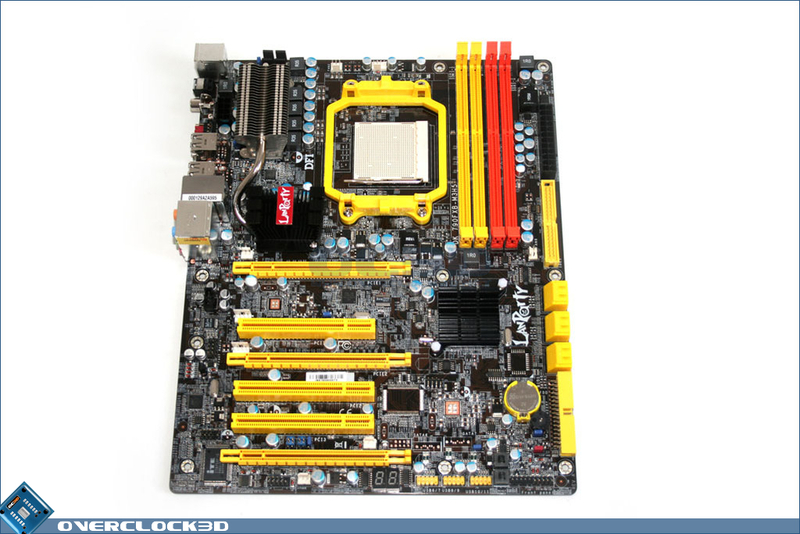 The backplate includes PS/2 keyboard and mouse ports along with coaxial and optical audio outputs, a CMOS clear jumper, 6xUSB 2.0 ports, Marvel Gigabit LAN port and and 7.1 HD audio. I can see the CMOS clear jumper proving a headache for most people who intend to use this board in an enclosure as fiddling with a jumper at the rear of the case is going to be no fun, especially if it needs to be done multiple times! 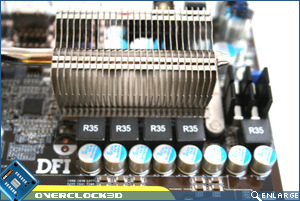 The three main heatsinks on the motherboard which are responsible for keeping temperatures in check are small in comparison to DFI's X58 motherboard and only the NB and PWM cooler are screwed to the motherboard with the SB 750 cooler having a traditional push pin design. I was happy to note that there was no anti tamper glue fixing the nuts to the screws as with the X58 range which made removal of the heatsinks so much easier. Should you wish to replace the NB cooler, DFI allow this option with the removable NB heatsink which is a great design and good news for those looking for something a little more extreme than ambient air. Our sample had an ample amount of paste used to transfer heat between the two surfaces but this could be improved by spreading the paste yourself, rather than relying on the 'blob' method DFI seem to have employed. Both the Northbridge and Southbridge had copious amounts of Arctic Ceramique type paste on the cores, perhaps a little too much but the contact pressure was even enough to squeeze excess paste over the core onto the surrounding area ensuring a good mount was achieved. 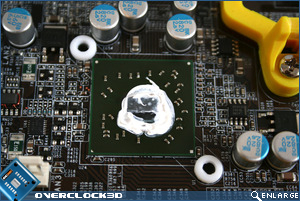 As always, extreme care should be taken if you decide to replace this paste as remounting the heatsink assembly could easily nibble the cores rendering the motherboard useless. 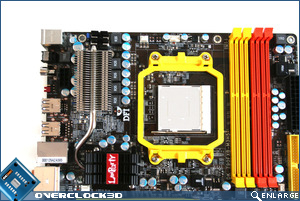 Overall, the DFI 790FXB DK M3H5 appears to be a solid motherboard. 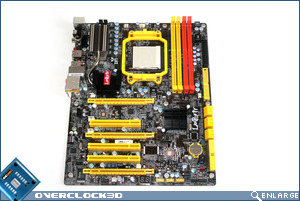 It has everything you could want from an enthusiasts or gamers point of view with plenty of connectivity for those looking to base a well rounded PC on this mainboard. 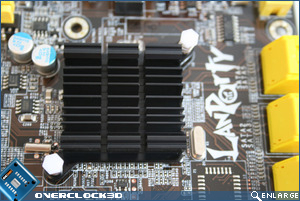 My only concern was the memory slots and this was certified when I came to set the board up as expected, the ram slots did indeed prevent oversized CPU coolers to be used with memory that employ double height heatsinks. 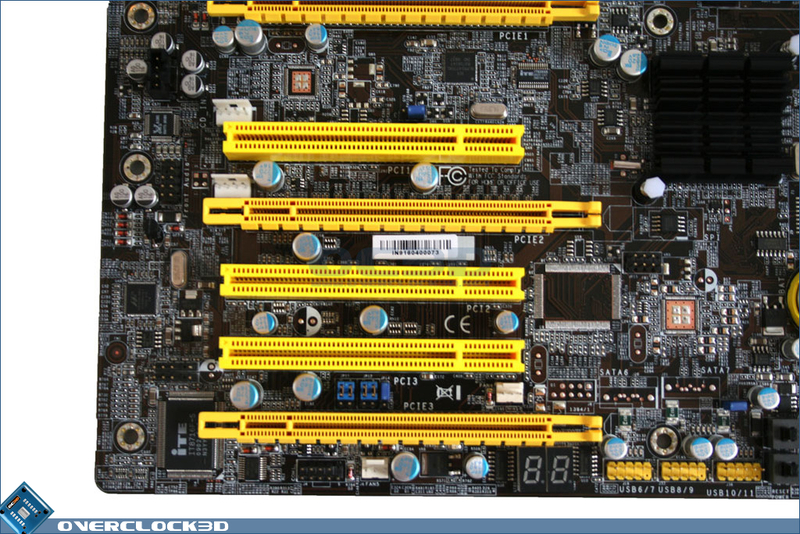 Using the memory in the Orange slots however was not an issue.